Looking for the perfect Miami Beach hotel? The beautiful Residence Inn Miami Beach Surfside is centrally located within many major attractions and is only steps from the beach! We had always wanted to stay at this hotel. We used to pass it on Collins Avenue as it was being built thinking, “Wow, that’s going to be a nice hotel.” Then in June, as a way to kick off Vicky’s birthday month, we finally got the opportunity. It ended up being the perfect way to start the celebrations off with a bang (check out our Instagram stories!) and we quickly fell in love with this Surfside hotel. The lobby of the hotel has a very Florida beach feel, with its white and aqua tones. The modern decor has nice accents throughout, making it a nice place to relax. Behind the lobby is a courtyard, and to the left of the lobby are tables where guests will enjoy a delicious breakfast. During our stay, we stayed in a Studio Suite, which has a king-size bed, desk area and large TV, and a full kitchenette. The bed was super comfy and we loved the modern bathroom. One of the things we loved most, however, was our view. We could see the ocean! The kitchenette came fully stocked! Once we were settled into our room, we had to go check out the pool! It is on the third floor of the hotel and has plenty of lounge chairs, hammocks, and cabanas. There is also a bar that you can order drinks and food from. Guests can also indulge at the bar on the first floor. It’s not a large area, but they serve great drinks and you can order food as well. We ordered one of their signature cocktails, the Coconut Surfside, which had coconut rum, blue Curacao, pineapple juice, and coconut milk. It was so good! We also nibbled on some spinach and artichoke dip. This hotel’s location really can’t be beat. With it being in the town of Surfside, it’s in the perfect central location to explore all of Miami Beach. After a 15 minute drive, guests can be walking along famous Ocean Drive in South Beach. Or heading north, guests can walk up Collins Avenue to do some shopping and dining at the upscale Bal Harbour Shops. Of course, a big draw for us was that you could literally walk across the street to the ocean. We love the Surfside beaches because they are not as crowded as the beaches in South Beach and the sand bar allows you to go out quiet a bit before it starts getting deep. Sure, there are plenty of hotels in Surfside, but without a doubt we would recommend staying at the Residence Inn Miami Beach Surfside. It’s close to all of the major Miami Beach attractions, but because it is located in Surfside, it’s got more of a relaxed vibe to it. Check out the Visit Surfside website to learn more about the town and what there is to do there. Our one complaint about the hotel would be the cost of parking. It’s $40 a night to valet or $37 to self park. It is Miami Beach though, so unfortunately prices are going to be high. Because the hotel is centrally located, depending how many nights you’re staying, it might be wiser to rely on ride sharing apps like Uber or Lyft. 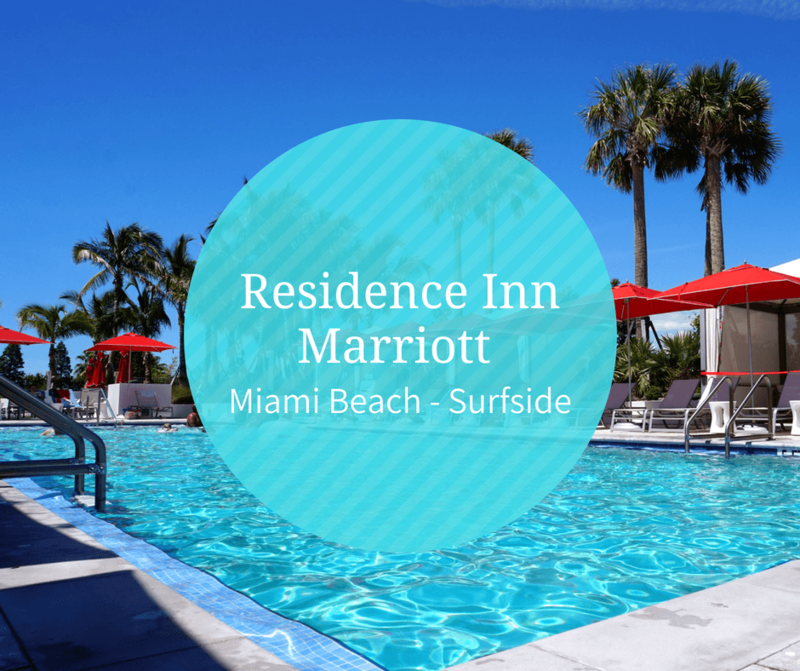 For more information or to book a stay at the Residence Inn Miami Beach – Surfside, we recommend visiting their website. Make sure to read our post on Free Things To Do In Miami. What a lovely looking place! I really appreciate having extra space in a room, and especially the kitchenette — we rarely cook but it’s great to be able to make teas and coffees and also be able to use plates etc for snacks we bring back in is ace! We visit Miami quite often. As new members of the Marriott Rewards program, we were looking for options in Miami. This post was quite timely. I am glad to hear that some of the rooms have views of the ocean and that it is a short walk to the water. I love that the pool has covered areas. I would want to head down early to get a cabana. I would like to stay here, it looks so clean and relaxing. That’s a bonus it is so close to the beach too, but the pool looks very inviting! I see myself sipping on a cocktail and lying a hammock. Yum – you’re making me hungry. I like the sound of the spinach and artichoke dip. As for the coconut surfside – what a treat! It all sounds and looks delicious. And what a beautiful location. Residence Inn Surfside seems o be a nice hotel to stay. The lobby looks so elegant and seems to harmoniously blend with the surroundings. The hotel looks elegant and great for a rejuvenating stay. Having experienced the Marriott hospitality at other locations, I can say that the Residence Inn seems to live up to the Marriott brand standards and promise. Marriott properties are most so good…hard to find fault in them. This one looks nice and cozy. It doesn’t look like a large hotel, so that works for me. I like the beach walk. Wow! That Beach looks incredible, your photos make me want to go there! It looks awesome place to visit. A lot of thanks sharing this post and finally great experience.